Youth Corps Singapore is looking for participants aged 18 to 35 years old to form YEP teams to China, Indonesia and Vietnam! Youth Expedition Project (YEP) is a Service-Learning programme by Youth Corps Singapore for youths, involving communities in Asia with a focus on the ASEAN region, China and India. YEP aims to nurture confident and resilient youths who are active citizens with the desire to make a difference both at home and overseas. The YEP Journey is about 6 – 9 months long. – Local Project that meets a local community need, with linkage to the Overseas Project to be conducted in Singapore within 3 months upon return. YEP is also a grant which provides partial financial support for eligible youths. 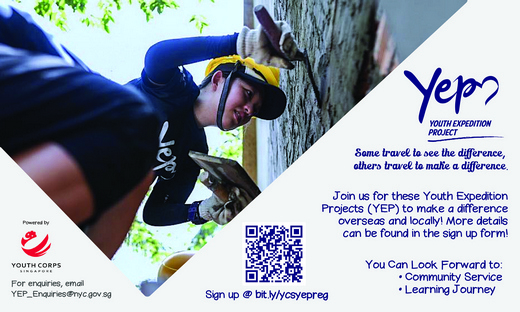 For more information about YEP or funding eligibility, please feel free to check out https://www.youthcorps.sg/en/initiative/#youth-expedition-project or Instagram at @yepsg or @youthcorpssg.